Yves Delorme’s 2006 Collection of home furnishings is on display at showrooms in New York, Dallas, Atlanta and Seattle, and will be available in stores in March. Like nature’s annual display of treasures, Yves Delorme’s home furnishings collection blooms anew each spring. The 2006 line finds inspiration from a range of sources -- the graceful sweep of a garden path, a traveler’s spellbinding stories, the ornamental detail of a sultan’s palace, and exotic spices from a foreign market. These images are captured and given new life through color, pattern, and texture in 18 new patterns for bed and bath that span four design sensibilities. For “Les Romantiques,” Yves Delorme weaves a web of romantic nights that blend irresistible charm with the modern appeal of classicism revisited. From the luminous beauty of “Aubepine,” with its all-over pastel floral, to the playful patchwork and palm leaves of “Caravane,” to the delicate display of printed or embroidered violets on “Violette” and “Violaine,” these linens echo the gardens of spring. Sophisticated coordinating accessories for bed and bath include elegantly embroidered towels, an exquisite embroidered silk counterpane, and fringed wool throws. The decorative spirit is evident among designs that find inspiration in everything from Renoir to the playing fields. Stripes and flowers -- on “Seine” and “Barbizon,” exotic fans and lotus blossoms -- “Evantail” and “Indochine,” and the geometry of circles and lines -- “Pois” and “Hockey” -- are given new interpretations on bed and bath linens for traditionalists and trendsetters. Palettes drawn from the seaside, the southwest, and the Far East repeat on accessories that boast such accents as colorful dobbies, elegant hemstitching, embroidery, and flirty fringe. Created with the discipline and elegance of beautiful architecture, these patterns invite new moments of refinement, combining noble fabrics with a true respect for the textile tradition. 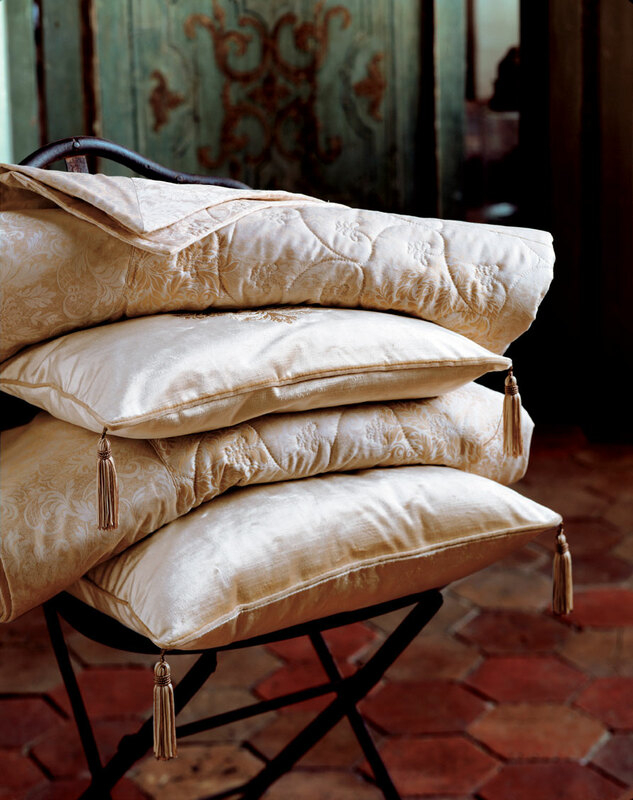 For each, a serenely neutral palette provides the backdrop for subtle textural variation created by a Jacquard weave -- “Medaillon,” an embroidered motif -- “Topkapi,” classic pintucks -- “Cluny,” or the combination of trompe l’oeil and a grosgrain trim -- “Cravate.” Rich accessories include tasseled velvet cushions and embroidered terry towels. A trio of patterns imbued with a sense of globetrotting adventure will enrich masculine or contemporary interiors. Executed in linen and paired with crisp white, “Fregate” gives denim blue a first-class upgrade. Jacquard navy and white stripes tailored with white piping and button shams lend “Nautique” a nautical and natty air. And “Galuchat” completes the travel theme with coordinating designs in chocolate, black, and mocha that evoke exotic woods and animals. All have handsome coordinating towels for the bath.